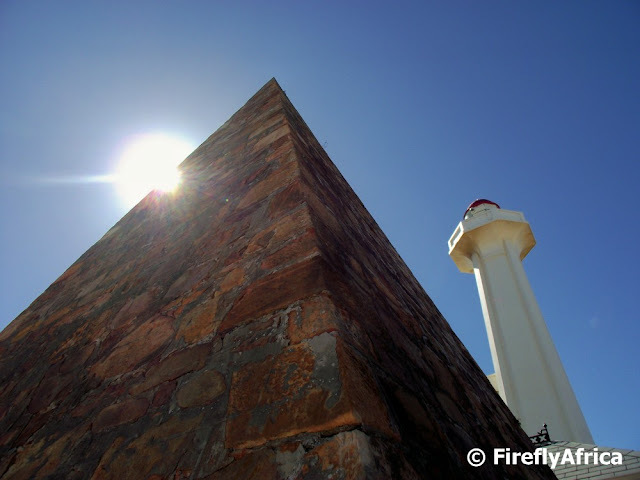 The sun peaking out from behind the Donkin Memorial on the Donkin Reserve. The Donkin Memorial was erected by Sir Rufane Donkin in 1820 in remembrance of his late wife Lady Elizabeth after whom he named the town. My first Skywatch contribution of the year. Eish, that's bad of me. 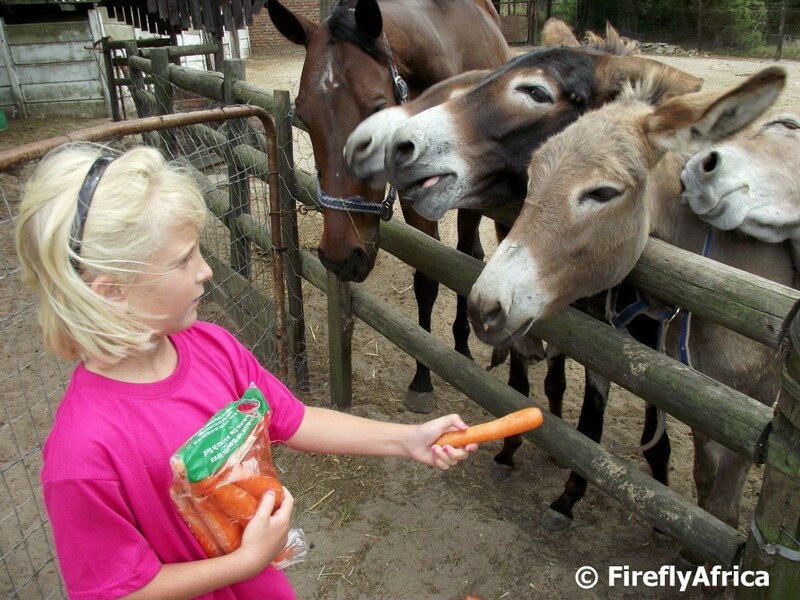 I don't know who gets more excited by our occasional visits to the East Cape Horse Care Unit, Drama Princess or the donkeys. These boys were lining up to get a carrot from her and even muscled the horse out the way to be in front. More people should actually take their kids to go and visit the Unit on Victoria Drive next to Animal Welfare. There is no cost to visit, just buy a bag of carrots to take along. As most of the Addo Elephant National Park is made up of what used to be farmlands, big parts of the park consist of open fields. 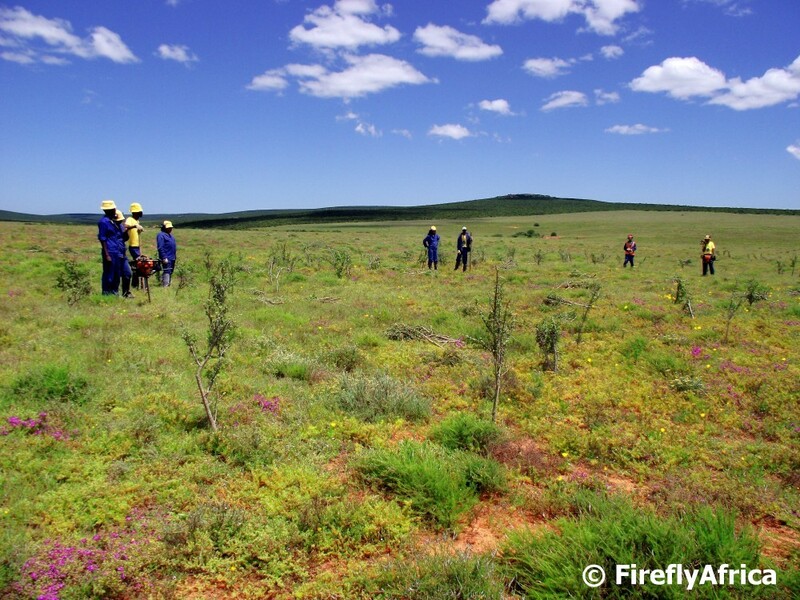 Addo has embarked on a project where locals are used to plant spekboom on these fields to help and bring the natural bush back quicker. 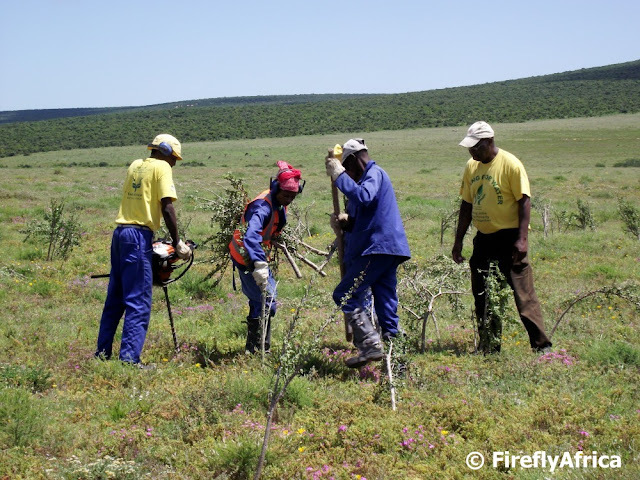 Spekboom (sometimes referred to as elephant bush as the ellies love to eat them) is an indigenous succulent bush and grows very easily and quickly, making it the ideal plant for the park. Because it contains so much water, it supplements the elephants' water intake which is one of the reasons its possible for Addo to have such a big concentration of these magnificent giants. A team of workers consist of three members. The first guy uses a drill machine to drill a hole into the hard ground, the second guy puts the spekboom branches (which are harvested in designated areas and will form roots very quickly) while the third guy used a pole to close the hole and compact it again. The fourth guy in the picture is the foreman who was on site when we visited. The EPSAC Community Art Centre, artEC, is the best place to go to see some of the top local established and emerging artists. They exhibits change every couple of weeks so return visits will always bring you something new. The gallery can be found in 36 Bird Street, Central. This is the last of the pics I took on our hike on the Maitland Nature Reserve's 9km trail in December. It was the first time I've been on the Maitland Trail and it just showed me that Port Elizabeth has so much that even I haven't seen. And people say there are nothing to do in PE. One of the latest new art installations on Route 67 takes the form of newspaper pages being blown around in the wind. The piece is situated behind St Mary's Cathedral as you go up the steps and tells the story of the uprising in the late 1960's and early 70's. After all the rain we had late last year the Maitland Nature Reserve trail was a little overgrown when I did it in December. What was nice though was the fact that everything was green and there were lots of flowers. We did have to bundu bash a bit every now and then, but it was worth the effort. One of the Memory Boxes in the Red Location Museum is dedicated to Vuyisile Mini, one of the first African National Congress members to be executed by apartheid South Africa. The space contains three nooses representing those that he was hung on along with Wilson Khayinga and Zinakile Mkaba. Vuyisile Mini was born in 1920 in the Port Elizabeth. Mini's militant political activities began in 1951 when he joined the ANC. In 1952 he was jailed with Govan Mbeki and Raymond Mhlaba for three months in North End Prison for participation in theDefiance Campaigm. In 1961 Mini was one of the first group of people to be recruited into uMkhonto we Sizwe (MK), and become a member of the Eastern Cape High Command. He was arrested on 10 May 1963 together with two other prominent ANC members, Wilson Khayinga and Zinakile Mkaba, charged with 17 counts of sabotage and other political crimes including complicity in the death of Sipho Mange, an alleged police informer and sentenced to death. Mini, Khayinga and Mkaba were hanged in the Pretoria Central Prison on 6 November 1964. Mini went to the gallows singing freedom songs, some he had composed. Port Elizabeth's Market Square in front of City Hall was renamed Vuyisile Mini Square a couple of years ago. In front of the newly refurbished Athenaeum building is what I find to be one of the most interesting art pieces on Route 67. The mosaic piece is called Harmony in Nature and is an anamorphic cylinder art piece. On the mosaic itself the picture which represents the animals and flowers of the Eastern Cape looks all squashed up but when you look at it in the cylinder's reflection it makes a perfect 3D picture. 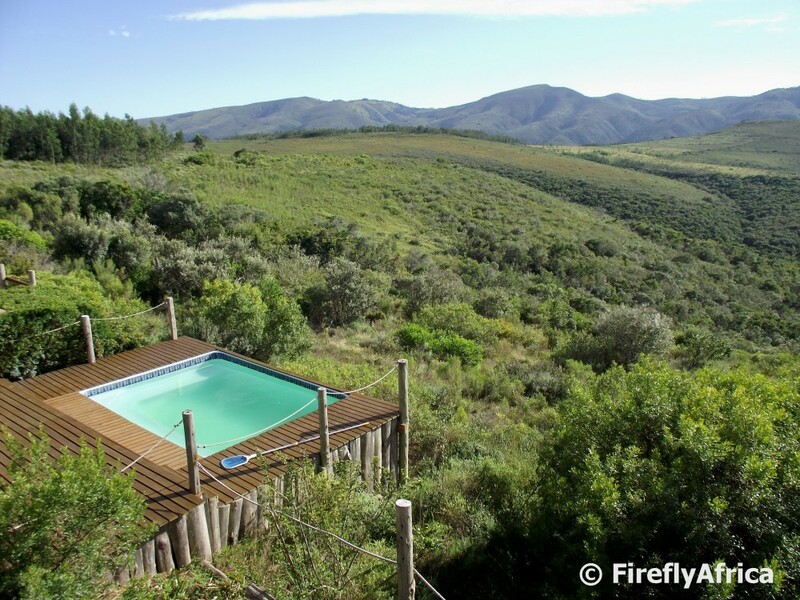 Kragga Kamma Game Park is the ideal spots to spend a weekend morning or afternoon. Its nice and close to the city and you get to see a wide variety of animals from the comfort of your own car. I always love seeing giraffes on any game drive and visiting Kragga Kamma is no different. When we were small we often took the bus to town with my mom and I remember the bus station to be a bit of a dark and dreary place. With the development of Route 67 all of this has changed. The area on Strand Street between the bus station and the next building has been opened up for more light to come in. The bus station also received one of the Route 67 art pieces which has also assisted in brightening it up. And bright it is. The new Bus Station Mural covers the whole back wall of the station and is a brightly coloured painting celebrating public transport and all the daily journeys undertaken by people living and working in Port Elizabeth. Everybody (well I hope everybody) in Port Elizabeth knows that if you are into filter coffee, THE place to buy your coffee is Masterton's in Russell Road. In actual fact, Masterton's coffee is available just about all over South Africa and is served in a lot of hotels and restaurants. There is nothing like going to the Masterton's shop to buy your coffee directly and smell the coffee being roasted, a smell you get even when you just drive by in your car. Masterton's have been operating for 88 years and have really become a Port Elizabeth icon. The founder of Masterton’s Coffee & Tea Specialists, Ronald John “Jock” Masterton, born 13 November 1897, came to South Africa from Scotland in 1920 at the age of 23 after serving as an officer in the Black Watch regiment during the First World War. During the war, a fellow officer from South Africa persuaded him to make a new beginning in the land of sunshine. As soon as the war ended he did just that. “Jock” worked as assistant manager on the farm “Three Rivers” in Vereeniging where he met his future wife Marjorie, who at the time was visiting her uncle the farm manager. In love, he made the logical move to Port Elizabeth, Marjorie’s home town, where her father was the Harbour Engineer in charge of building the breakwater, which still protects the Port Elizabeth harbour to this day. With the aim of establishing his own business, “Jock” travelled to Ceylon (modern day Sri Lanka), where he studied Tea Tasting, sampling more than 400 varieties of tea in a day. Returning to Port Elizabeth he opened “The Tea and Coffee House” at 33a Queen Street (now Govan Mbeki Avenue) 4 December 1924, and later moved to 114 Russell Road from where we still operate today. In the early years of the business, Masterton’s specialised in supplying the Port Elizabeth with top quality leaf teas, as tea was the “drink of choice” back then. As the demand for coffee began to grow, we extended our range to include coffee, which today what we are famed for throughout South Africa. Our very first bag of coffee was a Brazilian, costing 1 Pound 18 shillings and sixpence. Today we have a large variety of in-house blends to suit all palates, specially roasted and blended by the proprietor and roast master, James Masterton. 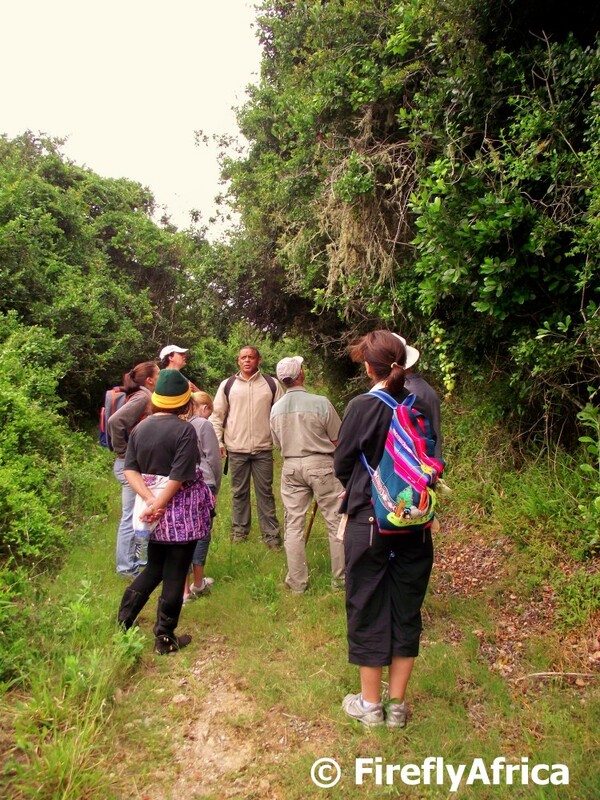 The Maitland Nature Reserve's 9km trail is one of Port Elizabeth's lesser known trails. I got to do it for the first time a little while ago and although it was very overgrown (not sure if its been cleared yet) I really enjoyed it. Most of the trail goes through indigenous bush and coastal forest with great views of the Maitland dune and coastline at the turning point. 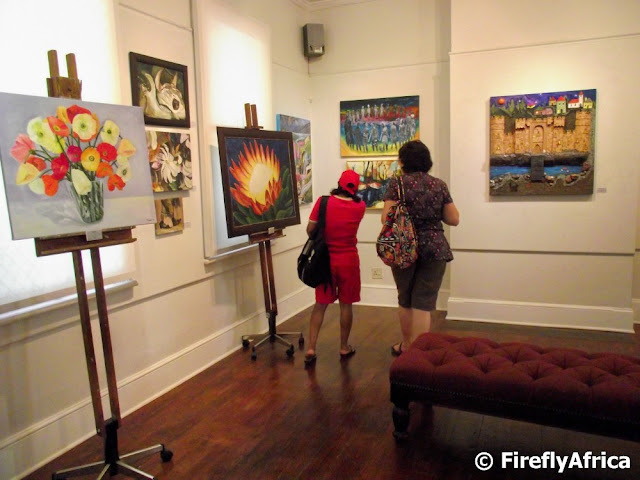 I was part of a very delightful and well supported art walk which visited a number of art galleries around Central. The Eye on Art television crew accompanied us on the walk to film it as an insert. Eye on Art is a weekly interactive, lifestyle magazine show on Bay TV, specialising on the art scene through the artist's eye. It broadcasts on Saturdays at 17:30 with repeats on Sundays at 12.30pm, Tuesdays at 7pm & Wednesdays at 11am. Bay TV can be seen free to air around Nelson Mandela Bay and on Dstv (Channel 260). Here they are interviewing on of the ladies who went on the walk at the Nelson Mandela Metropolitan Art Museum. Route 67 has some very interesting art pieces with each one representing something specific. The Fishbone sculpture on Market Square reconnects the city's Central Business District with the Port Elizabeth Harbour's fishing industry which has been a very important aspect of the city in the past and still presently. The group in the background of the picture was a tour of Route 67 that I was part of. One of the participants was Kathy of Dempsey's Guesthouse in Walmer who did a blog post with some beautiful pictures about the walk afterwards. The view down onto Govan Mbeki Road (Main Street) from the third floor of the historic Fisher's Building in downtown Port Elizabeth. The St Mary's Cathedral is in the centre of the picture and the City Hall on the left. Tourists visiting the Port Elizabeth townships are always amazed at the ladies selling traditional medicines and remedies in Njoli Square. They items they sell covers everything from cures for common ailments to little bundles of what is commonly known as Bushman's bedding which is burned to chase evil spirits away. There is even a drink to strengthen your ... Lets just call it a natural Viagra drink. There were 633 rhino's poached in South Africa in 2012. It a very sad and shocking statistic and even with millions of rands collected for anti-poaching activities and millions of people made aware of the fact, it seems that the problem is still far from being solved. This picture of a young white rhino was taken at one of the game reserves close to Port Elizabeth, but the poaching problem means that I just don't want to disclose which one. The Atheneaum is currently playing host to 67 beaded works of art. The art was commissioned by the Mandela Bay Development Agency and each of the 67 pieces represent a year and a quote by Nelson Mandela. The MBDA is also going to publish a book with pictures of the artwork and the quotes and is also still deciding where the beaded pieces will find a permanent home. The upgrade of the Athenaeum Building in Central by the Mandela Bay Development Agency has just about been completed with the revamp of the old Little Theatre. I got to get a peek inside the Little Theatre the other day and have to say that it looks very good right from the foyer right through to the theatre itself. The one thing that really stands out is the theatre's seating, now covered in bright colours. Old Man's Beard is a lichen that grows on trees and is normally on found where there is no air pollution present. You find a lot of Old Man's Beard in the Tsitsikamma as well as on the game reserves close to Port Elizabeth, but you won't find it in the city itself. On a recent half day hike through the Maitland Nature Reserve west of the city I spotted clumps of Old Man's Beard which shows that its possible to get right out into nature so close to home. 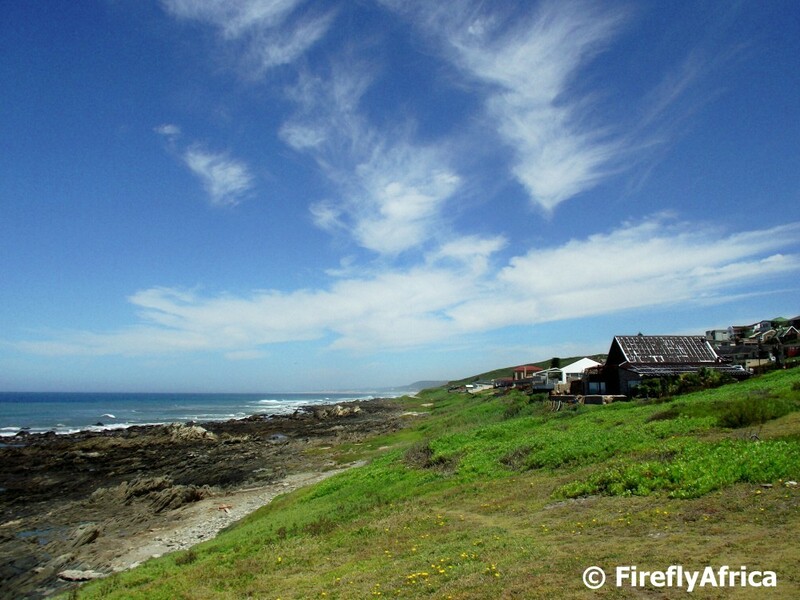 The suburbs (I've never heard of them being referred to as villages like Schoenmakerskop does) of Seaview and Beachview to the west of Port Elizabeth has some of the most envied coastal views anywhere in the city. 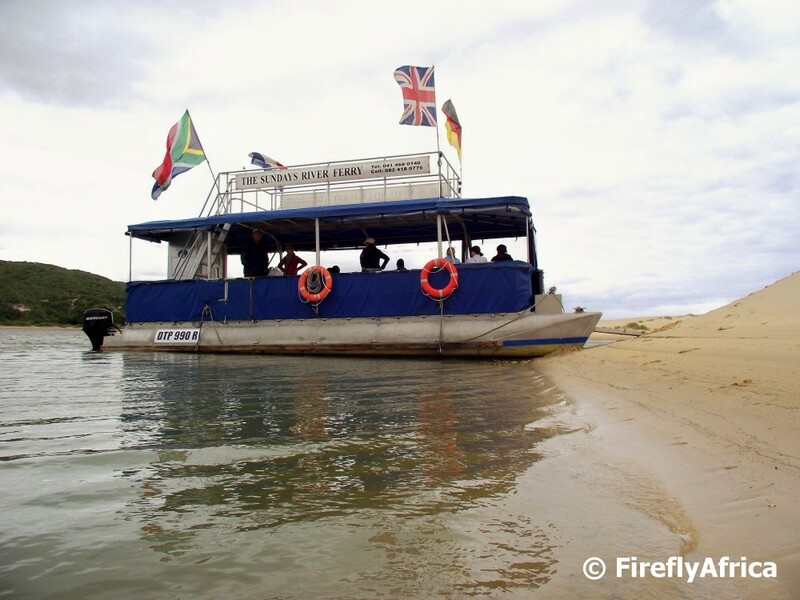 I know I've done posts about the Sundays River Ferry before, but it stays one of my favorite attractions and activities in Port Elizabeth. I enjoy the relaxed atmosphere of the cruise down the river, the chance of seeing birds or water monitors along the river bank, the company of owners Les and Maggie and to climb to the top of the dunes at the turning point. Really a wonderful experience and you will definitively see it again in future. 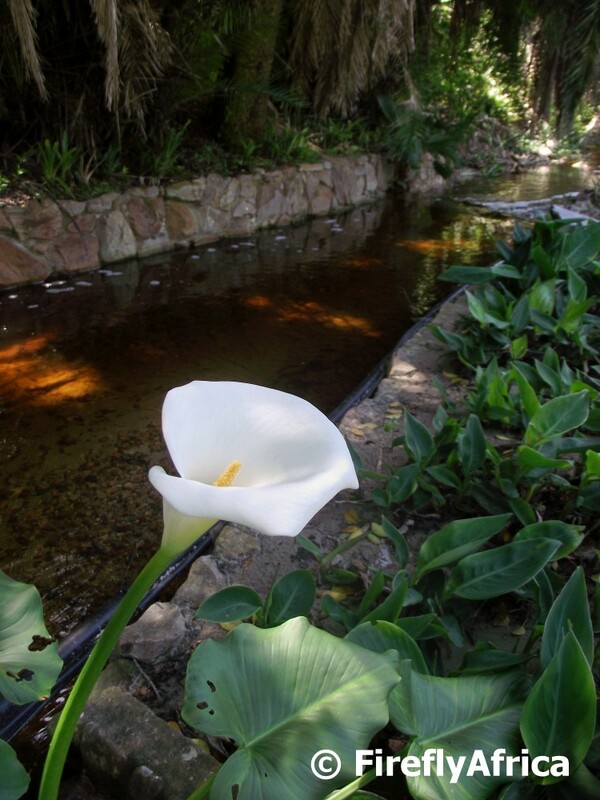 Not everybody likes arum lilies but I have a special fondness for them, specially when they grow wild somewhere in nature. I found this one growing along the Shark River in Happy Valley. 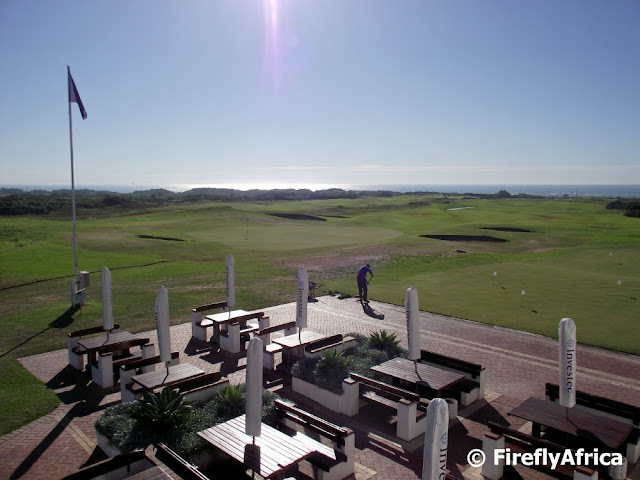 Early morning on the upstairs balcony of the Humewood Golf Club clubhouse looking back at the 18th green. Kinda makes me wish I played golf so that I could try out this magnificent links course. A couple of week ago we spent a night along with a couple of friends at the Sand River Getaway in the Elands River Valley just to the west of Port Elizabeth. So close to the city yet it felt like we were in a totally different area. The Sand River Getaway has a couple of tented rooms on platforms and a big communal area which include a kitchen, lounge, dining area and ablution facilities. Standing on the outside deck this is the view towards the mountains in the distance. Wish the weather was hot enough at the time to enjoy the view from the swimming pool. DISCLOSURE: We visited Sand River Getaway as guests of our friends who paid for the stay. I received no remuniration to write this post. I would like to wish all the followers, and accidental visitors, of Port Elizabeth Daily Photo a HAPPY NEW YEAR. May 2013 be your year and bring all of you lots of pleasure, happiness, prosperity and a fair degree of riches. 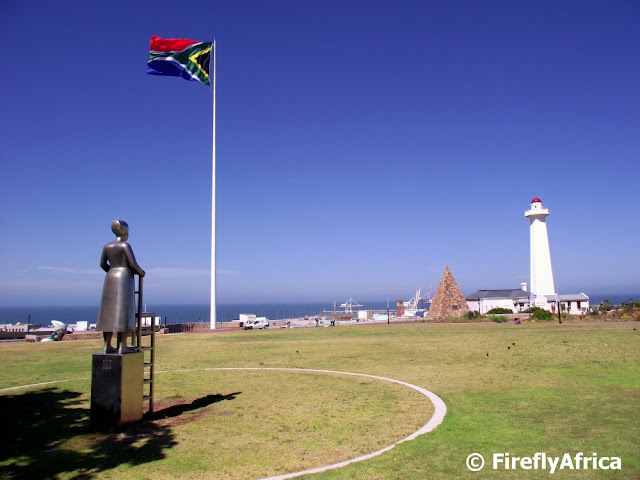 I'm starting out the year by posting one of my favourite places in Port Elizabeth, The Donkin Reserve with the historic lighthouse and pyramid standing side by side with the new art pieces that has been installed in the area as part of Route 67.